The Song of Ice and Fire RPG doesn't just allow you to have adventures in Westeros – it lets you inhabit Westeros, creating your own noble house to vie for control of the Seven Kingdoms and play the Game of Thrones. I've played dozens of RPGs and read dozens more. Very few have fired my imagination (and stirred my gaming group's excitement) the way the Green Ronin's Song of Ice and Fire RPG has. The SoIaF rules start with a very simple basic mechanic that lets you get on with the business of plotting, betraying, and scheming. It then builds more complex systems on top of that mechanic, systems that dovetail with George R.R. Martin's rich and often brutal world. The basic mechanic works like this: a given task has a target number based on its difficulty. Each character has a series of Abilities, like Persuasion or Marksmanship, with a simple rating that tells you how many six-sided dice to roll when you make a check with that Ability. You might have a 3 in Marksmanship, so when you fire an arrow at a target, you roll 3 D6s, adding their numbers together to see if you've met or exceeded the target number. Within each Ability are a number of Specialties that give you bonus dice in certain situations. The Deception Ability, for instance, has Specialties for Bluff, Cheat, Disguise, and others. So if you had a Deception score of 4 with a 2B Specialty in Disguise, you would actually roll six dice when making a Disguise check. However, the bonus dice do not add to the overall total – you take the four highest rolls of your six dice and add those together, discarding the lower two. Bonus dice increase your chances of hitting a high total without making Specialties too powerful. Character creation uses a point spend system to buy Abilities and Specialties. There are no classes or levels, so you can mix Abilities, Specialities, Benefits (which are a lot like feats in other RPGs) make whatever type of character you want. A noble knight, a deceiving maester, a seductive prince, a nimble mercenary expertly trained in the healing arts – the flexibility is amazing. Characters are not perfectly balanced (Westeros is not an egalitarian place after all) – a random roll determines your character's age, which sets the amount of experience you can spend, but which can also result in various afflictions or frailties. While you have total control over the character you build, reacting to random rolls on a series of tables makes the creation process tremendously fun. These tables help you build a story for your character that fits into the world of the novels and TV series. The tables indicate elements of personality or history, but only in very broad strokes. The background events table, for instances, has entries like, "You were falsely accused of a wrongdoing," and, "You had a torrid love affair." As you go through the process, you piece together these story and character fragments into a cohesive backstory. One of the characters we created was a naïve, idealistic knight who pines for a Dornish princess. The low status of his house and the fact that he was accused of participating in an attack that blinded her add a tragic element to his story, along with the fact that the smallfolk believe he's cursed. Instead of your typical adventuring party, the players in the Song of Ice and Fire RPG are all members of the same noble house. The creation of the house is just as interesting and fun as character creation. Because creating a house is a joint activity for the entire group, we've found that it actually makes for a great "story game" on its own. We've created a fallen house that chose the wrong side in the Greyjoy Rebellion and seeks a return to glory by pleading forgiveness from Ned Stark, and a family of reclusive eccentrics claiming lineage to the children of the forest. There are extensive rules for creating your house's colors and coat of arms, and you even get you come up with your own house words. The combat system is straightforward – although there can be a lot variables in play, it generally goes much more quickly than in other RPGs, because getting wacked with swords and axes is very deadly. There are advanced rules for adding critical hits, counterattacks, weapon reach length and the like, but these elements are modular so you can add whatever suits your particular taste for simulationism and complexity. Because tournament combat and jousting plays a such an important role in life among the noble houses, there are separate rules for that as well. What's particularly interesting is that deception, bargaining, and other elements of intrigue get their own resolution system. These "social combats" are referred to "Intrigues." This is, of course, in keeping with the source material, where arranged marriages and courtly lies are as important as battles and jousts. Characters even have derived statistics for these intrigues, similar to combat defense and health (in this case, intrigue defense and composure). So a character who would be terrible in a swordfight can be absolutely brilliant at intrigues. Someone who is a fan of the books or series and is familiar with the people and houses of Westeros will obviously get a lot more enjoyment out of this game. However, the period during which the game is set is right before the first novel, before Ned Stark has been called to become the King's Hand. So a detailed knowledge of multiple lengthy novels is not necessary by any means. The book offers a spoiler-free primer on the history of major places and battles, and I find that A Wiki of Ice and Fire is an invaluable resource even for someone's who's read them all. Green Ronin created a new edition of the core rules of A Song of Ice and Fire RPG when the TV series began. Called the Game of Thrones Edition, it has new (and stunningly great) cover art and includes the previously separate adventure Peril at King's Landing. If life in a noble house squabbling over scraps of power in Westeros seems…well, ignoble, a second book offers an intriguing option. Night's Watch lets you run a group of characters who have taken the black and serve at the Wall. In this case, you create your own castle, and the players play the men who serve there (the book even offers some suggestions for getting around the in-world prohibition of women serving in the Night's Watch, such as desperate recruitment efforts in the face of the Others or even a castle inhabited by an all-female order of rangers). During this time period, only three of the nineteen existing castles at the wall are manned, and those only barely. So there's plenty of room for creative license. Choose one of the empty castles, make it your home, rename it, and populate it with brigands and bastards who've taken the black. 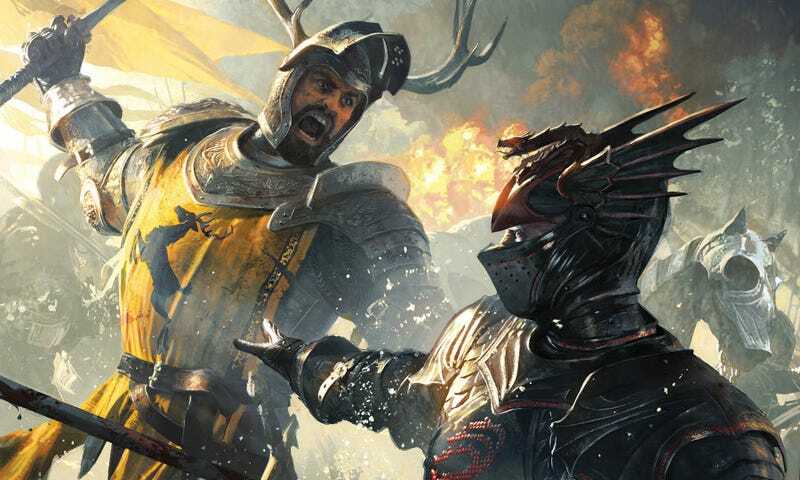 This kind of campaign can certainly become embroiled in Westerosi intrigue, but it also lends itself more readily to traditional fantasy role-playing tropes. You can have long, dangerous adventures beyond the wall, battling (or forming uneasy alliances with) the Wildlings, or uncovering the creeping horror of the Others. You might even find some long-forgotten dungeons underneath those abandoned castles to go crawling about in. I'm a George R.R. Martin fanboy, undoubtedly, so you can take my praise for A Song of ice and Fire RPG with a grain of salt. But it does offer some very rich and exciting opportunities for role-playing in a familiar world – a place we'd never want to live in, but could be great fun to visit. I'd even go so far as to suggest it would make a great holiday gift.